Satellite view of changing glacier termini in the Bhutan-Himalaya. A glacier terminus, toe, or snout, is the end of a glacier at any given point in time. Although glaciers seem motionless to the observer, in reality glaciers are in endless motion and the glacier terminus is always either advancing or retreating. The location of the terminus is often directly related to glacier mass balance, which is based on the amount of snowfall which occurs in the accumulation zone of a glacier, as compared to the amount that is melted in the ablation zone. The position of a glacier terminus is also impacted by localized or regional temperature change over time. Tracking the change in location of a glacier terminus is a method of monitoring a glacier's movement. The end of the glacier terminus is measured from a fixed position in neighboring bedrock periodically over time. The difference in location of a glacier terminus as measured from this fixed position at different time intervals provides a record of the glacier's change. A similar way of tracking glacier change is comparing photographs of the glacier's position at different times. The form of a glacier terminus is determined by many factors. 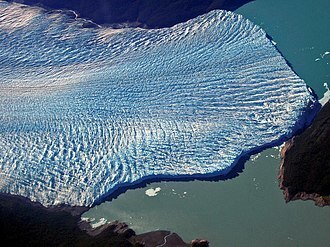 If the glacier is retreating, it is usually mildly sloping in form because a melting glacier tends to assume this shape. But there are many conditions that alter this typical shape, including the presence of thermal fields and various stresses that cause cracking and melting feedback resulting in glacial calving and other diverse forms. The photograph above shows the glacial lakes formed by the retreating glacial termini on the surface of the debris-covered glaciers over the last several decades in the Bhutan-Himalaya region. ^ "All About Glaciers - Glacier Terminus". National Snow and Ice Data Center. Archived from the original on 2007-12-21. Retrieved 2007-11-25. ^ "Techniques for studying glacier change". Archived from the original on September 3, 2006. Retrieved 2007-03-21. ^ "Glossary of Selected Glacier and Related Terminology". USGS. Retrieved 2007-11-25. Wikimedia Commons has media related to Glacier termini. An ice shelf is a thick floating platform of ice that forms where a glacier or ice sheet flows down to a coastline and onto the ocean surface. Ice shelves are only found in Antarctica, Canada, the boundary between the floating ice shelf and the grounded ice that feeds it is called the grounding line. The thickness of ice shelves ranges from about 100 to 1000 meters, in contrast, sea ice is formed on water, is much thinner, and forms throughout the Arctic Ocean. It is found in the Southern Ocean around the continent of Antarctica, Ice shelves are principally driven by gravity-driven pressure from the grounded ice. That flow continually moves ice from the line to the seaward front of the shelf. The primary mechanism of mass loss from ice shelves was thought to have been iceberg calving, typically, a shelf front will extend forward for years or decades between major calving events. Snow accumulation on the surface and melting from the lower surface are important to the mass balance of an ice shelf. Ice may accrete onto the underside of the shelf, the density contrast between glacial ice, which is denser than normal ice, and liquid water means that only about 1/9 of the floating ice is above the ocean surface. The worlds largest ice shelves are the Ross Ice Shelf and the Filchner-Ronne Ice Shelf in Antarctica, the term captured ice shelf has been used for the ice over a subglacial lake, such as Lake Vostok. All Canadian ice shelves are attached to Ellesmere Island and lie north of 82°N, Ice shelves that are still in existence are the Alfred Ernest Ice Shelf, Milne Ice Shelf, Ward Hunt Ice Shelf and Smith Ice Shelf. 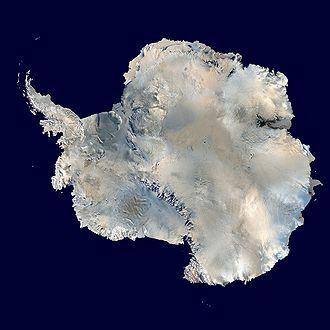 The MClintock Ice Shelf broke up from 1963 to 1966, the Ayles Ice Shelf broke up in 2005, a total of 74 percent of the Antarctic coastline has ice shelves attached. Their aggregate area is over 1,550,000 km2, in the last several decades, glaciologists have observed consistent decreases in ice shelf extent through melt and complete disintegration of some shelves. The Ellesmere ice shelf reduced by 90 percent in the century, leaving the separate Alfred Ernest, Milne, Ward Hunt. 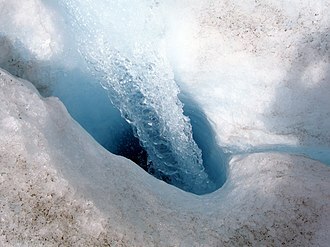 A crevasse is a deep crack, or fracture, found in an ice sheet or glacier, as opposed to a crevice that forms in rock. Crevasses form as a result of the movement and resulting stress associated with the shear stress generated when two pieces above a plastic substrate have different rates of movement. The resulting intensity of the stress causes a breakage along the faces. 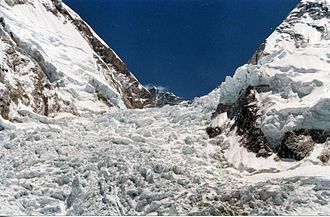 Crevasses often have vertical or near-vertical walls, which can melt and create seracs, arches. These walls sometimes expose layers that represent the glaciers stratigraphy, Crevasse size often depends upon the amount of liquid water present in the glacier. A crevasse may be as deep as 45 metres, as wide as 20 metres, a crevasse may be covered, but not necessarily filled, by a snow bridge made of the previous years accumulation and snow drifts. The result is that crevasses are rendered invisible, and thus potentially lethal to anyone attempting to navigate their way across a glacier, occasionally a snow bridge over an old crevasse may begin to sag, providing some landscape relief, but this cannot be relied upon. Anyone planning to travel on a glacier should be trained in crevasse rescue, the presence of water in a crevasse can significantly increase its penetration. Longitudinal crevasses form parallel to flow where the width is expanding. They develop in areas of stress, such as where a valley widens or bends. They are typically concave down and form a greater than 45° with the margin. Splashing crevasses result from shear stress from the margin of the glacier and they extend from the glaciers margin and are concave up with respect to glacier flow, making an angle less than 45° with the margin. At the centre line of the glacier, there is zero pure shear from the margins, transverse crevasses are the most common crevasse type. They form in a zone of longitudinal extension where the stresses are parallel to the direction of glacier flow. These crevasses stretch across the glacier transverse to the flow direction and they generally form where a valley becomes steeper. Bergschrund Bowie Crevasse Field Glaciology Paterson, W. S.
Mendenhall Glacier is a glacier about 13.6 miles long located in Mendenhall Valley, about 12 miles from downtown Juneau in the southeast area of the U. S. state of Alaska. The glacier and surrounding landscape is protected as part of the 5, 815-acre Mendenhall Glacier Recreation Area, the Juneau Icefield Research Program has monitored the outlet glaciers of the Juneau Icefield since 1942, including Mendenhall Glacier. The glacier has retreated 1.75 miles since 1929, when Mendenhall Lake was created, the end of the glacier currently has a negative glacier mass balance and will continue to retreat in the foreseeable future. 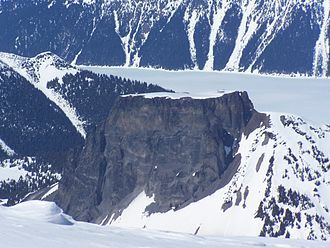 This is because increasing amounts of warm, moist air will be carried up to the head of the icefield, the increased amount of snow will feed the icefield, possibly enough to offset the continually increasing melting experienced at the glaciers terminus. However, this phenomenon will fade away if temperatures continue to climb. It was originally known as Sitaantaago or Aakwtaaksit, latinized as Aakwtaaksit, the glacier was named Auke Glacier by naturalist John Muir for the Tlingit Auk Kwaan band in 1888. In 1891 it was renamed in honor of Thomas Corwin Mendenhall and it extends from the Juneau Icefield, its source, to Mendenhall Lake. The glacier has recently come to the forefront of the debate on global warming. The US Forest Service, which manages the Mendenhall Glacier, says because glaciers are a product of climate, the Mendenhall glacier has been in retreat since the end of the Little Ice Age in the 1700s. It is expected the glacier face will soon out of the lake. The retreat of the Mendenhall Glacier and other glaciers in the area is believed by some to be a result of broader retreat, the Juneau Icefield is the fifth largest icefield in North America. For many populations near glacial areas these glaciers are a source of drinking water. Once these glaciers are gone the people relying on this water will be out of their familiar fresh water source. For example, Anchorage is one of the most populated cities in Alaska, if the recession of this glacier continues they will be out of their main source of water. A glacial lake outburst flood is a type of outburst flood that occurs when the dam containing a glacial lake fails. An event similar to a GLOF, where a body of water contained by a glacier melts or overflows the glacier, is called a Jökulhlaup, the dam can consist of glacier ice or a terminal moraine. A glacial lake outburst flood is a type of outburst flood occurring when water dammed by a glacier or a moraine is released. A water body that is dammed by the front of a glacier is called a lake. When a marginal lake bursts, it may be called a marginal lake drainage, when a sub-glacial lake bursts, it may be called a jökulhlaup. A jökulhlaup is thus a sub-glacial outburst flood, Glacial lake volumes vary, but may hold millions to hundreds of millions of cubic metres of water. Catastrophic failure of the ice or glacial sediment can release this water over periods of minutes to days. On a downstream floodplain, it suggests a somewhat slower inundation spreading as much as 10 kilometres wide, both scenarios are significant threats to life and infrastructure. The United Nations has a series of monitoring efforts to prevent death. The importance of this situation has magnified over the past century due to increased populations, there are a number of imminent deadly GLOFs situations that have been identified worldwide. The Tsho Rolpa glacier lake is located in the Rolwaling Valley, about 110 kilometres northeast of Kathmandu, the lake is dammed by a 150 metres high unconsolidated terminal moraine dam. The most famous are the immense jökulhlaup released from the Vatnajökull Ice Cap in Iceland and it is not by chance that the term jökulhlaup comes from Icelandic, as the south of Iceland has very often been the victim of such catastrophes. The jökulhlaup reached a rate of 50,000 cubic metres per second. The flood carried ice floes that weighed up to 5000 tons with icebergs between 100–200 tons striking the Gigjukvisl Bridge of the Ring Road, the tsunami released was up to 4 metres high and 600 metres wide. The flood carried with it 185 million tons of silt, the jökulhlaup flow made it for several days the 2nd largest river after the Amazon. Studied by glaciologists, the temporal coincidence of glacier retreat with the measured increase of atmospheric greenhouse gases is often cited as an evidentiary underpinning of global warming. Glacier mass balance is the key determinant of the health of a glacier, Glaciers in retreat will have negative mass balances, and if they do not find an equilibrium between accumulation and ablation, will eventually disappear. The Little Ice Age was a period from about 1550 to 1850 when the world experienced relatively cooler temperatures compared to the present, until about 1940, glaciers around the world retreated as the climate warmed substantially. Glacial retreat slowed and even reversed temporarily, in many cases, in locations such as the Andes of South America and Himalayas in Asia, the demise of glaciers in these regions has the potential to affect water supplies in those areas. The acceleration of the rate of retreat since 1995 of key outlet glaciers of the Greenland and West Antarctic ice sheets may foreshadow a rise in sea level, the mass balance, or difference between accumulation and ablation, of a glacier is crucial to its survival. Climate change may cause variations in temperature and snowfall, resulting in changes in mass balance. A glacier with a negative balance loses equilibrium and retreats. A sustained positive balance is out of equilibrium and will advance to reestablish equilibrium. Currently, nearly all glaciers have a mass balance and are retreating. Glacier retreat results in the loss of the region of the glacier. Since higher elevations are cooler, the disappearance of the lowest portion decreases overall ablation, thereby increasing mass balance, methods for measuring retreat include staking terminus location, global positioning mapping, aerial mapping and laser altimetry. The key symptom of disequilibrium is thinning along the length of the glacier. This indicates a diminishment of the accumulation zone, the result is marginal recession of the accumulation zone margin, not just of the terminus. In effect, the no longer has a consistent accumulation zone. 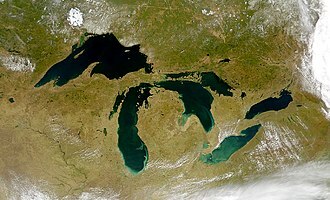 However, the Grinnell Glacier in Montana, U. S. will shrink at an increasing rate until it disappears. Aufeis, is a sheet-like mass of layered ice that forms from successive flows of ground water during freezing temperatures. This form of ice is called overflow, icings, or the Russian term, the term was first used in 1859 by A. T. von Middendorff following his observations of the phenomenon in northern Siberia. Aufeis accumulates during winter along stream and river valleys in arctic and subarctic environments and it forms by upwelling of river water behind ice dams, or by ground-water discharge. The latter mechanism prevails in high-gradient alpine streams as they freeze solid, successive ice layers can lead to aufeis accumulations that are several meters thick. Aufeis typically melts out during summer and will form in the same place year after year. Sheets of aufeis may block stream channels and cause their flood plains to widen as spring floodwaters are forced to flow around the ice, research on aufeis has to a large extent been motivated by the variety of engineering problems the ice sheets can cause. An icefall is a portion of certain glaciers characterized by rapid flow and a chaotic crevassed surface. The term icefall is formed by analogy with the waterfall, a similar. 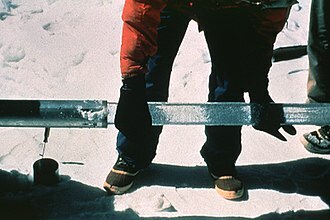 When ice movement is faster than elsewhere, because the glacier bed steepens or narrows, the flow cannot be accommodated by plastic deformation, where two fractures meet, seracs can be formed. When the movement of the ice slows down, the crevasses can coalesce, perhaps the most conspicuous consequence of glacier flow, icefalls occur where the glacier bed steepens and/or narrows. Most glacier ice flows at speeds of a few hundred metres per year or less, the flow of ice in an icefall may be measured in kilometres per year. Such rapid flow cannot be accommodated by deformation of the ice. Instead, the ice fractures forming crevasses, intersecting fractures form ice columns or seracs. These processes are imperceptible for the most part, however, a serac may collapse or topple abruptly and this behavior often poses the biggest risk to mountaineers climbing in an icefall. A terminal moraine, called end moraine, is a type of moraine that forms at the snout of a glacier, marking its maximum advance. 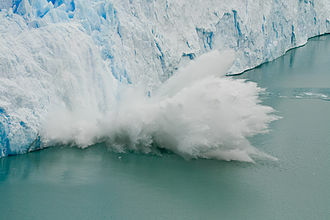 At this point, debris that has accumulated by plucking and abrasion, because the glacier acts very much like a conveyor belt, the longer it stays in one place, the greater the amount of material that will be deposited. The moraine is left as the point of the terminal extent of the ice. Terminal moraines are one of the most prominent types of moraines in the Arctic, one famous terminal moraine is the Giants Wall in Norway which, according to legend, was built by giants to keep intruders out of their realm. In North America, the Outer Lands is a given to the terminal moraine archipelago of the northeastern region of the United States. Other prominent examples of terminal moraines are the Tinley Moraine and the Valparaiso Moraine and these moraines are most clearly seen southwest of Chicago. In Europe, virtually all the terrain in the central Netherlands is made up of a terminal moraine. Global glacial mass balance in the last fifty years, reported to the WGMS and NSIDC. The downward trend in the late 1980s is symptomatic of the increased rate and number of retreating glaciers. Southern Patagonia Ice Field from ISS, astronaut photo. North is to the right. The 730 m (2,400 ft) icefall (center) in the Roosevelt Glacier, Mount Baker, Washington, U.S.
An icefall feeding into the Lambert Glacier, Antarctica. A small icefall on east lobe of the new Crater Glacier on Mount Saint Helens. 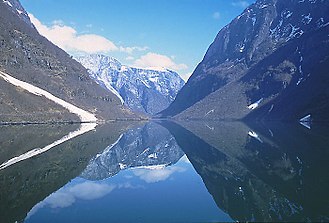 Sognefjord in Norway, the second longest fjord in the world, shows characteristic overdeepening. Coniston Water illustrates a typical fjord lake profile with length exceeding width by a factor of 10. New York's Finger Lakes. 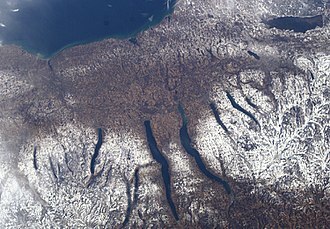 Lying below Lake Ontario the Finger Lakes formed in tunnel valleys. Overdeepened basins in the Gamburtsev Mountains of Antarctica. Furtwängler Glacier atop Kilimanjaro in the foreground and snowfields and the Northern Icefields beyond. This glacier cave has been excavated by a hot spring underneath a snow field in south central Iceland, a country where such formations are common due to the high geothermal and volcanic activity, plus the high latitude, cold weather, and frequent snowfall. Sampling the surface of a glacier. There is increasingly dense firn between surface snow and blue glacier ice. Ablation near the electrode in a flashtube. The high-energy electrical arc slowly erodes the glass, leaving a frosted appearance.